How do we mobilize the numbers needed to truly stop the fossil fuel industry, topple the systems that let it run amuck, and create truly decentralized and democratized energy systems?? 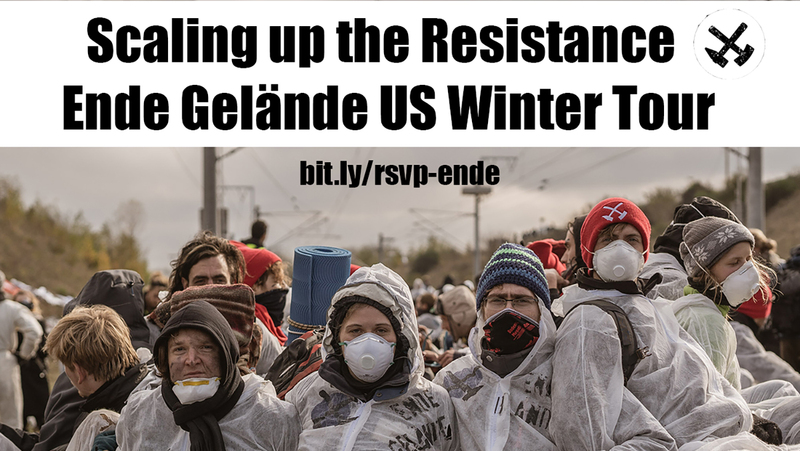 Join Rising Tide North America and activists from radical climate justice group Ende Gelände for the Scaling Up Resistance US Tour! WHAT'S HAPPENING?! Let's share strategies from Germany's widely successful mass climate justice mobilizations and see how they can apply in the U.S.! RSVP HERE to get specific tour updates. A radical climate justice movement — called Ende Gelände ("Here and No Further") — has been growing in Germany. It was founded on principles of frontline struggles, mass mobilization, direct action, and cooperation across organizational and tactical differences with local and municipal power-building strategies. Ende Gelände organized 6000 people to block a coal mine. Together with the Hambach Forest Occupation and it's dozens of tree-sits, local Resistance and national mobilizations, the German Climate movement is on the brink of stopping coal. No small feat, right? Demonstrators invaded mining pits, danced in front of the diggers, slept on the railways, and provoked pictures that made the connection between climate chaos and capitalism and exposed the dirty truth behind the German energy transition “Energiewende”. Join the Scaling up the Resistance Tour now and let’s talk about how we can scale-up our fossil fuel resistance! Help us get down the road! Support our tour with a donation here! Can't catch a tour date in person? Join us online for the Scaling up the Resistance Tour Webinar! March 11th at 8pm Eastern/5pm Pacific.